Among this year's finalists for the Samuel J. Heyman Service to America Medal is Dennis Reuter, a planetary scientist at NASA's Goddard Space Flight Center in Greenbelt, Maryland. Named for the Partnership for Public Service's late founder, the award recognizes federal employees who "break down barriers, overcoming huge challenges and getting results." "It's very gratifying that the team is being selected for this," Reuter said. "The LEISA instrument has provided some really groundbreaking data and it's very exciting that it's being recognized at this level." Reuter and the team were selected as finalists by a committee that included government officials, educators and industry leaders for their contributions to the New Horizons mission to Pluto, which flew by the dwarf planet in July 2015. Together with his colleagues, Reuter developed New Horizons' LEISA infrared imaging spectrometer, which provided observations to map Pluto's surface and to determine its composition. LEISA is part of the Ralph instrument, which serves as the eyes of New Horizons. Ralph also contains the Multispectral Visible Imaging Camera. LEISA measures wavelengths of infrared light to identify different elements and compounds on the dwarf planet's surface. These wavelengths form a kind of elemental fingerprint from which scientists can identify compounds like water, methane and carbon monoxide - all of which were found on Pluto's surface. LEISA's observations changed scientists' understanding of the outer solar system, said Lucy-Ann McFadden, a Goddard scientist. They showed that Pluto has an active surface consisting of a variety of terrains, including ice. They have also provided unique information about the other bodies in the Pluto system. "Nobody expected to see what we're seeing," Reuter said. These observations greatly expand on previous knowledge about the dwarf planet. "We basically had these blurry pictures of Pluto," said Paul Mahaffy, director of Goddard's Solar System Exploration Division. "It is so far away, and we had no information on the details of the geology. The data is telling us what Pluto is like. It is opening our eyes to a place in the solar system that took decades to reach." Reuter and his colleagues built the instrument to confirm their belief that there was more to Pluto than meets the eye. "To think there would be more than just a dirty ice ball was an incredible thought," Goddard Center Director Chris Scolese said. "Dennis wasn't the only one to think that, but he came up with the concept for the instrument that could measure properties they thought were there. And he convinced others it could be done." Developing the instrument was a challenge - the team had to work with numerous requirements. It had to be lightweight, use little power and operate at temperatures as low as minus 455 Fahrenheit. The instrument also had to be sensitive enough to pick up light from the sun, which was 1,000 times fainter at Pluto than on Earth, and needed high resolution to pick out different wavelengths and different compounds on Pluto. But perhaps the biggest innovation was that LEISA contained no moving parts, which could have worn out over the long journey and rendered it inoperable. 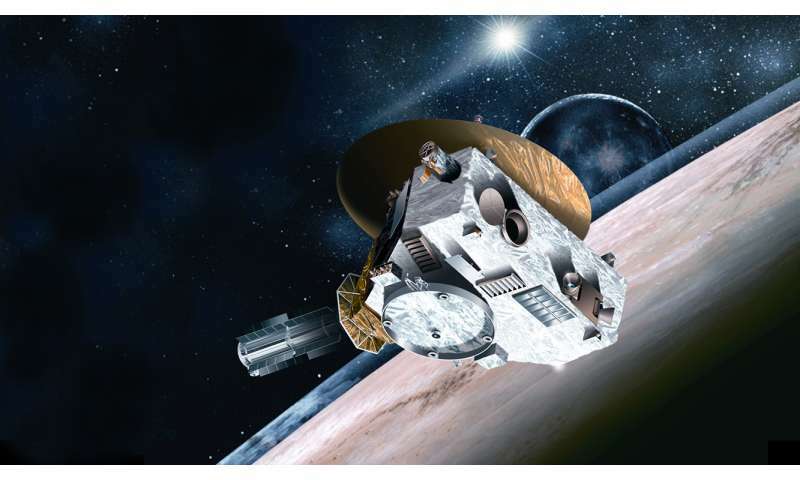 LEISA's design and construction took Reuter and his team nearly two decades, even with the help of industry partners and the support of Alan Stern, the New Horizons principal investigator from the Southwest Research Institute, San Antonio, Texas. Then, they waited another nine years to see the data it would send back from its destination. But at least they didn't need to wait nine years to confirm it would work. Reuter said LEISA opened its eyes for the first time during a flyby of Jupiter, about 14 months after launch. Eight years later, they saw the first images from Pluto. "We could see spectra, we could see features, we could see molecules," Reuter said. The correlation between surface features and composition has given scientists insight into the processes on the dwarf planet. "It defines delayed gratification." Reuter said that the great results seen from LEISA and New Horizons are a testament to how well the team worked together, including the Goddard group and a wider team consisting of research centers, such as the mission manager, Johns Hopkins University Applied Physics Laboratory, universities, other NASA centers, industry partners, and more. About two-thirds of New Horizons' data has been communicated to the ground, as of late April 2016. Now scientists are waiting to find out if New Horizons' mission will continue as it flies further into the Kuiper Belt. Also among this year's honorees is Jenn Gustetic, who is on detail from NASA to the White House Office of Science and Technology Policy, where she has served as assistant director for open innovation since September 2014. Gustetic has helped NASA leverage crowdsourcing, prize contests and challenges to benefit from innovation outside the agency.